Group of eight (8) early 19th century land grants, all Tennessee Governor signed. Includes two (2) signed Joseph McMinn (1816 & 1818), three (3) signed William Carroll (1820 & 1822), two (2) signed Newton Cannon (1838 & 1839), and one (1) signed James Jones (1841). Six of the grants award land to John Davis, one awards land to Daniel Rolfs, assignee of John Overton, and one awards land to Nathaniel M. Carroll. Ranging in size from 9 3/4" x 16" to 13" x 16". Provenance: the estate of Sarah Hunter Hicks Green, formerly of Historic Devon Farm, Nashville, Tennessee. 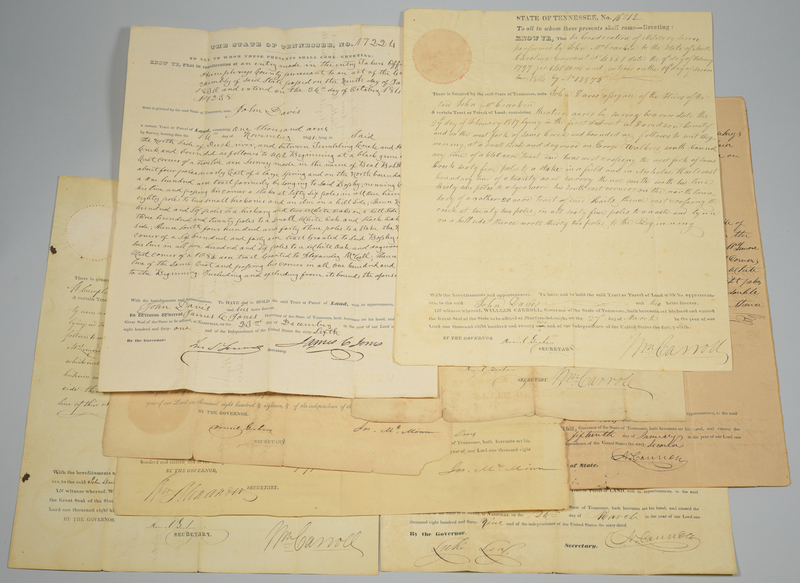 CONDITION: One McMinn grant with tear to lower right edge, some separation at upper and center folds. One Carroll grant with separation to upper and center folds. All with overall toning and expected fold lines.